ORAFOL Americas Inc. is a global manufacturer of graphics films, reflective solutions, and adhesive tape products for a variety of industries. The company’s Avon, CT plant manufactures the leading brand of DOT-C2 compliant conspicuity tapes for the heavy-duty truck and trailer market. The plant’s Director of Engineering, Gary Gauer, was tasked with resolving increasing downtime issues on an existing film coating line. At the heart of the problem was the equipment’s legacy control system. The coater was built in the mid-90s and the existing obsolete drives and controls were no longer supported by the original manufacturer. The equipment could no longer be adequately serviced due to the lack of technical support and availability of replacement components and parts. The frequency of downtime was increasing as well as frustration for the hours of service required. The production line also had aging third-party equipment needing to be upgraded or replaced including integrating a new UV Curing system and a new rotary printer into the line. Integrating the new equipment required mechanical design changes to make the new equipment physically compatible with the existing line. The coating process is very intricate, requiring expert engineering knowledge of complex winders, tension controls and web transport systems. In addition, capturing live production data such as temperatures of ovens, tensions on rollers, and feed rates added to the complexity. After researching and receiving multiple proposals from potential solution providers, Gauer chose Electronic Drives and Controls (EDC) to provide a turnkey systems integration solution. “I was impressed by the diversity of projects that EDC had undertaken, their technical knowledge, and their focus on customer satisfaction,” said Gauer. As primary contractor, EDC was responsible for all aspects of the project both mechanical and electrical including design, procurement, removal, installation, along with the startup and tuning. In addition, EDC managed vendors, suppliers, other engineers, and machine shops; a lot had to come together at the same time to make a project of this magnitude flow smoothly. The existing automation system was based on multiple platforms including Wonderware, GE, Cleveland Controls, Square D, and proprietary automation. EDC recommended separating out the Wonderware interface, utilizing it as an Historian and moving to a more robust PanelView Operator Interface. 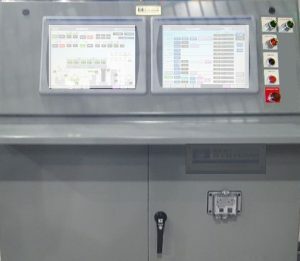 Rockwell Automation’s PLCs have the capability of “recognizing” other Rockwell components such as drives, HMIs and remote I/O resulting in an effortless configuration of the network. This makes the transfer of commands, data and parameters much smoother and the task of bringing third-party equipment online less challenging, especially when Ethernet communications can be utilized. Rockwell Automation products used include Allen-Bradley ControlLogix PLCs, PowerFlex 755 closed loop vector variable frequency drives (VFDs), PowerFlex 525 AC Drives, PanelView Plus 6 HMIs, and Stratix Ethernet switches. 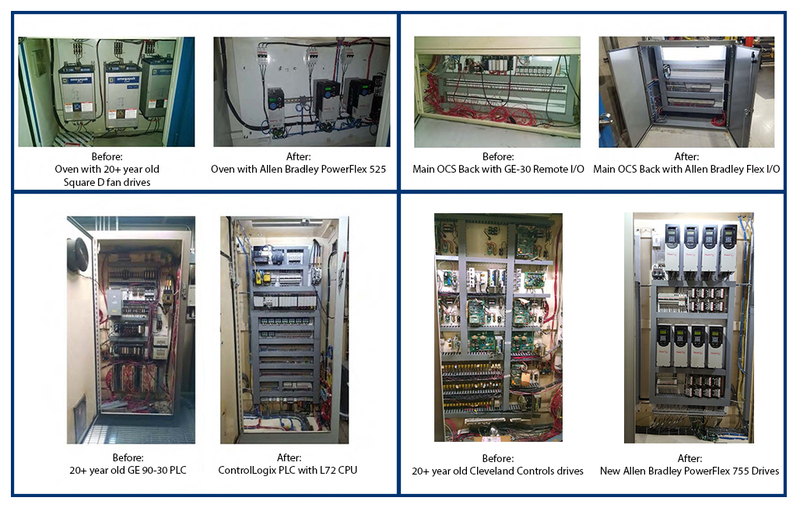 These were complemented by Allen-Bradley FLEX I/O modules, and an assortment of safety components and sensors. The EDC team worked with ORAFOL’s engineers to customize the system for optimum efficiency and ease of use for the machine operators. EDC engineers developed the software and programmed the new drives and control system, breathing new life into the 20-year-old coating line. EDC integrated all third-party equipment (i.e. UV system and printer), and programmed the back-and-forth communication to each system, such as tension set points, lamp level control, line speed feedback, lamp setpoints & On/Off, Enable, Fault Reset, Shutters Open, etc. These parameters are controlled and indicated on the Rockwell HMIs. 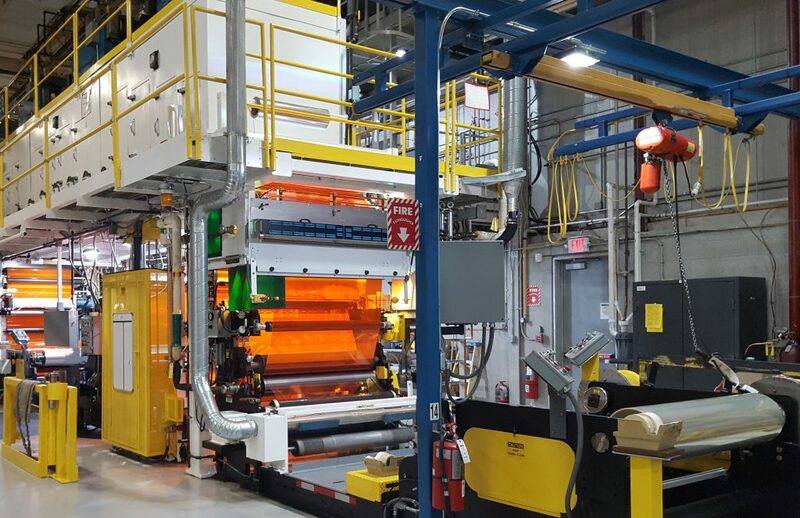 In addition to electrical control system integration, EDC completed a mechanical redesign to build new brackets and fixtures to retrofit the existing machine frame to accommodate the installation of the UV curing system, Lower Flammability Limit (LFL) sensors and printing equipment. ORAFOL now has a reliable, modern, state-of-the-art coating line. Old analog components are now digital. All the drives and touch screens are digitally connected over Ethernet. The old operator control station (OCS) full of meters and things to switch on and off (Figure 1) was replaced with two new user-friendly touchscreen PanelView Plus 6 HMIs (Figure 2). The new PanelView Plus 6 HMIs provide a graphical interface that allows the operator to view, monitor, and control all status information. In addition, the newer technology allows for adding recipes and modern functionality not available when the coating line was built 20 years ago. In Figure 2, the screen on the left features a “bird’s eye view,” allowing visibility of the entire web path with key process variables. The HMI on the right allows the operator to drill down into function-specific set-up, display and alarm screens. Operators can easily access recipes and set up one product to run today and another to run tomorrow with a few touches of the screen. The preset recipes eliminate variations with the batches, now producing consistent quality. The graphic display also allows operators to visually detect any problems immediately and act quickly to resolve them. The retrofit also enhanced safety with the introduction of a safety PLC, which provides better control and visibility of the large line. If an E-stop is depressed, the operator can see where and why on the HMI screen. The E-stop that was pushed is flashing to let operators know which one it is, aiding in quick resolution of the problem. Much of the coating area was explosive. In these areas hardware and installation were rated for Explosion-proof Class I Div 1. Temperature control is now centralized through the PLC and monitored at the Main OCS. 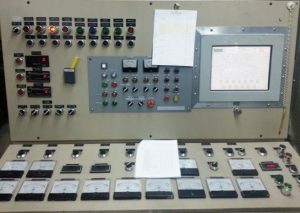 Prior to the upgrade, operators had to change the temperature at each of the individual temperature controllers separately. Now temperature changes are made with one touch on the display screen, or embedded in a product-specific recipe. Energy savings usually come hand in hand with control system upgrades, especially when moving from legacy, inefficient DC drives to an inherently brushless VFD technology that also loses less of its input power to heat. For this project, additional energy savings came with the upgrade to the UV curing system, whose technology has improved significantly over the years. Finally, with the remote access module installed into the machine, future engineering changes are much quicker and less expensive to implement. From troubleshooting a problem to changing a recipe, EDC can help via a secure encrypted virtual private network (VPN). A recent recipe change was completed via VPN by EDC in less time than it would have taken to drive to ORAFOL’s facility. To learn more about this case study, click to download.